Posted September 4th, 2018 by Mobile Music School & filed under Educational - How to Guides. This week, we explain how to teach a fun-filled, interactive rhythm activity that goes down a treat in our classroom music programmes! Great for getting the whole class engaged, this rhythm activity gets every student involved in the music making process. Start by drawing the music notes up on the board behind you. Instruct the class with this interactive song and actions and let the class sing along after you. We would love the opportunity to come and share our passion for music with even more schools this year. Please get in touch with us today to discuss our music programmes or to arrange for us to drop out. 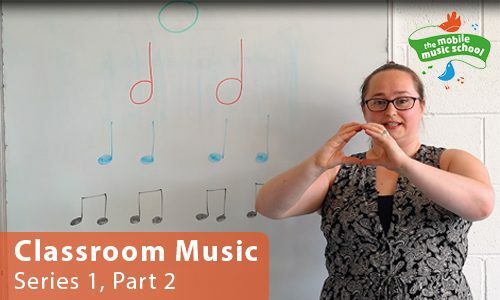 MMS tutor how-to guides: Classroom Music – Series 1, Part 3 coming next week!